1. Preheat the oven to 220°C, gas mark 7. Toss the potato wedges and pepper in oil and chipotle paste and spread out onto a baking tray in a single layer. Roast for 20-25 minutes until golden and crispy then transfer to a shallow heatproof dish. 2. 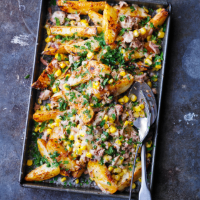 Mix the sweetcorn and tuna and spoon onto the potatoes. Top with cheese, place under a preheated grill for 2-3 minutes, then sprinkle with parsley and serve.